Polyspots are lined up in half/circle fashion in front of four basketball hoops. It helps to have basketball hoops of different heights. Each team (6 teams) has a basketball to dribble to a spot on the floor. Set up the spots so that the green and yellow spots are at the taller hoops and harder shots. The purple and orange spots will be the easiest shots at the shortest hoops. On the start signal, one player from each team will dribble to a spot and try score a basket. The players may have both feet on the spot, or one foot in back and one foot on the spot. No feet in front of the spot. If they miss the shot, they have one more opportunity to make it. If both shots are missed, they must dribble back to their relay team and pass to the next player in line. If the shot is made on the first or second try, the player should pick up that spot and dribble the ball in one hand and carry the spot in the other hand back to their relay team. Pass the ball to the next player in line and go to the end of the line. A maximum of one polyspot per turn. Each team will start a pile of spots and try to accumulate the most points. Remind players that they must dribble to and from the polyspots. At the end of the game, teams may count up their points. 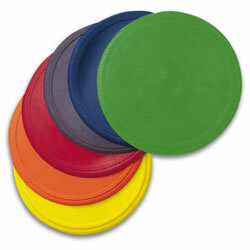 Musical Hula Hoops or Polyspots: These items are interchangeable. We introduce them at separate times. Equipment and Setup: Hula hoops are spread around the floor in random order. The teacher gives direction, then starts the music, student move in the locomotor skill indicated. When the music stops students balance on one foot inside of a hula hoop near them. Then, the teacher demonstrates different actions to complete at the hoop. When this is complete, the teacher gives a different locomotor skill to move in. The warmup continues in this fashion. Compass: Feet in hoop – Move hands around outside of hoop. Around the World – Hands in hoop – Walk feet around outside. Skip around hoop forwards, then backwards. Step through your hoop, when it’s standing. Roll your hoop – try to go through it while it’s moving. Equipment and Setup: Hula Hoops Spread around the floor in random order. All activities stop and start by balancing on one foot. The teacher gives the direction and the type of locomotor movement to start with, then starts the music, students move around the gym, when the music stops students balance on one foot, on the nearest spot. Six groups of students are lined up relay style at one end of the gym. Set a pail with beanbags at the opposite side of the gym. Put the poly spots in a circle surrounding the the pail. Put the 5 point spots closest to the pail, the 10 point spots go next. The spots that are the most challenging are the 20 point spots which are placed the furthest out. Each color team (6 teams) has it’s own beanbag and may only throw and retrieve that beanbag. On the start signal one player from each team takes their beanbag to a spot and tries to throw it into the pail in center of gym. One foot may be on the spot and the the other foot must be behind the spot. If the player makes it into the pail, they will pick up the poly spot and take it back to their team. If a player misses the pail, they just run and pick up the beanbag and return it to the next player on their team, then go to the end of the line. Play continues until all of the spots are gone. Players may want to add up their points at the end of the game.